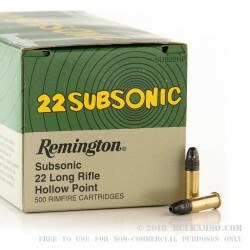 A large case lot of 5000 rounds of the well-known well-loved subsonic .22LR round by Remington. 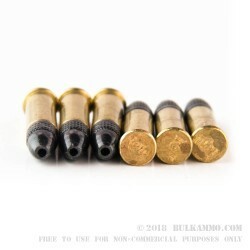 The serious balance of this .22 Long Rifle round gives the shooter a versatile cartridge hat can be used suppressed or not, while still allowing most small game that the .22LR is suitable for hunting, to be dispatched without a lot of effect on the performance variables of the .22LR despite the lower velocity. This round can easily be used on squirrel, rabbit, small birds and even up to coyote sized targets if strategically used. 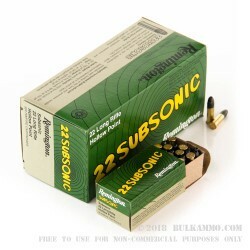 Having been a proven round for so long, this is one of the better-known load offerings in the Remington lineup and is still well-known outside of the brand, because it is one of the longest standing subsonic rounds on the market. This 38 grain lead hollow point projectile offers good performance out to 75 yards or so without any compensation for the noticeably slower velocity, which ensures that most use cases are accounted for most shooters. 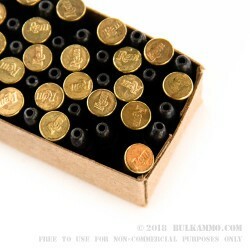 An obvious choice for plinking, target shooting indoors and hunting, this is a round that is remembered not only by its characteristic and vastly unchanged box and marketing materials, but also by its value for the money spent.